I know I have not been a good blogger, lately. Eventually, life will settle down again. Right now, I am adjusting to my new promotion at work, trying to get a handle on running my department, and dealing with budget issues, and staff shortages. And, taking care of Mom. Her treatment regimen is getting much more hectic. Tomorrow, she has labs at 8:30 a.m., and if her blood counts are up enough, she will be admitted to the hospital to begin harvesting her own stem cells, which will later be transplanted back into her system, after she undergoes a potent round of chemo that will basically wipe out her immune system, and hopefully any lingering cancer cells that may still be lurking. The doctor said this will give her the best chance of it not returning, though it is certainly no guarantee. I am fearful that she will not survive the treatment. The chemo will be administered for five days in a row, a Mon thru Fri. It will be after she recovers from the harvesting process, which will be a three or four day process. She seems so much more frail…she only weighs around 105 lbs. It is taking quite an emotional toll on all of us, but she is a tough little fighter. I have been working on a very cute Christmas quilt for Sheril, and wanted to post a quick update for her. I was hoping to finish it this weekend, but I think I’m going to come up a bit short. I’m so thankful that I have the most patient, understanding clients a quilter could ask for! So, to help with the waiting…here is a little peek! It’s been a fun one to quilt! It sounds like you are totally stressed! I hope your Mom’s treatment goes well. 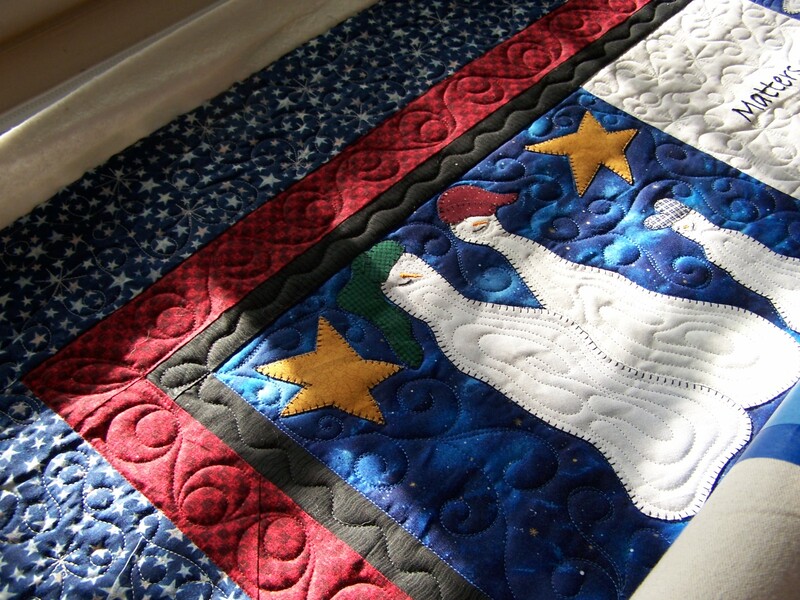 At least you have your quilting to relax. Saying prayers your Mother Randi. Lifting you and your family up in prayer. I am praying that your Mom’s treatment will be successfull. 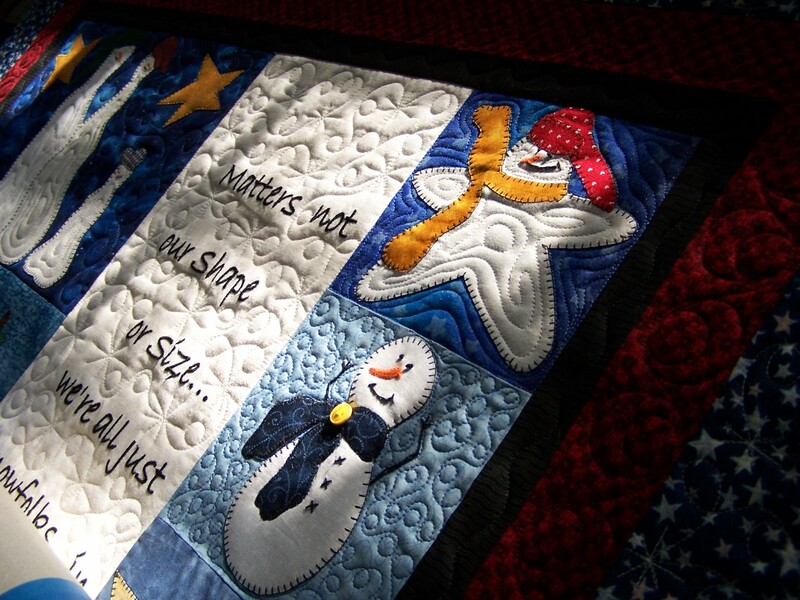 I will be thinking about you and your mom, Randi…the quilt looks great! It looks like you had fun with it! Randi, you, your mother and the rest of your family have been on my mind and in my prayers. 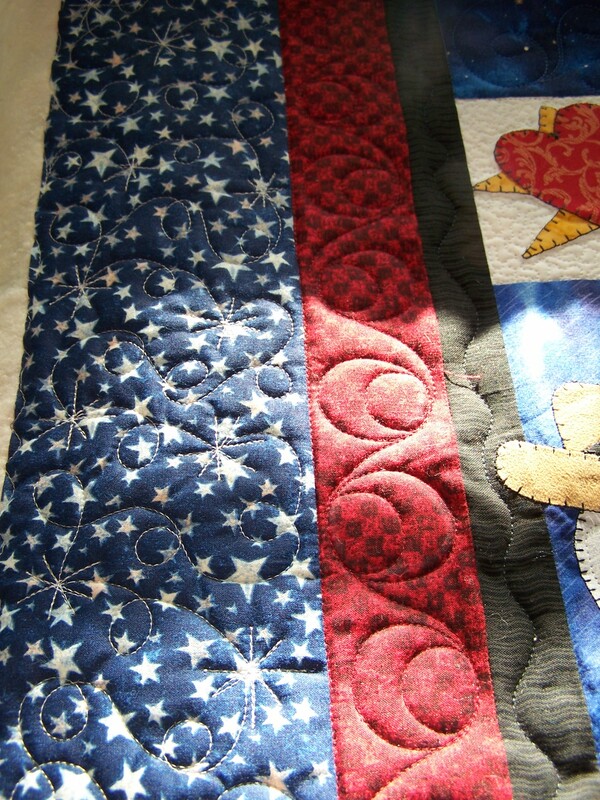 It is wonderful to read an update, to know how you are doing and to get the opportunity to see more of your lovely quilting. That is so very cute, Randi. Will keep your mother in my thoughts and prayers. « Did you think I fled the country?